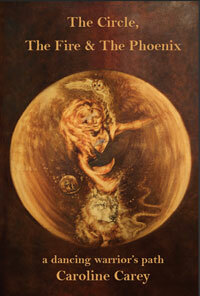 Caroline's latest book about her personal journeys, evolving through Movement Medicine and the dancing warrior path. She describes the effects of living and teaching with this work in her own unique style.Caroline's latest book about her personal journey of healing and her journey within Movement Medicine. connected to the authentic masculine and feminine, as well as our true soul purpose in this lifetime. The Circle is the beginning of our spiritual practice, where we begin with ourselves. It teaches us about our true selves and the work we need to do in order to take responsibility of and develop a strong feminine - yin and a strong masculine - yang energy. It asks us to embrace our polarities and be both the authentic and mature feminine and masculine in our lives. It offers us the possibility of knowing our circle as elemental forces, as all that is below and all that is above us. Bringing into our circle of strength our allies and connections to both the physical world and the spiritual. Most importantly it invites us to reach a place of ‘authentic maturity’ whether we are ordinary folk, parents, workers, artists or political leaders running countries.